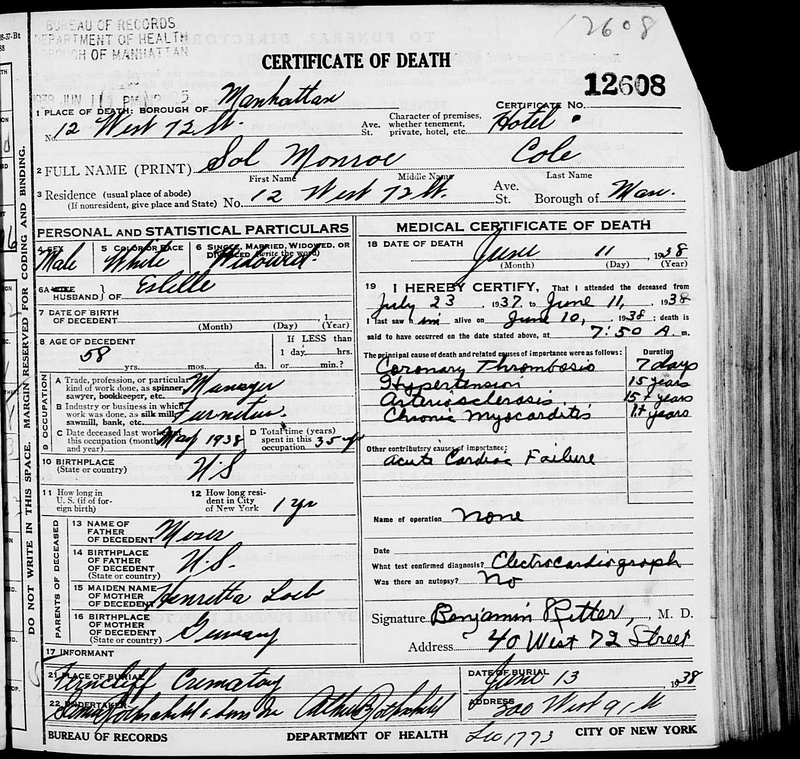 Yesterday I received a copy of the death certificate of Sol Cole, who died on June 11, 1938. I learned a number of things from this document. First, Sol died of heart disease when he was only 58 years old. He had had hypertension and arteriosclerosis for fifteen years and myocarditis for over a year, and then for a week before he died, he suffered from coronary thrombosis and finally acute cardiac failure. He had been under the same doctor’s care for close to a year and had been living in New York City for about the same period of time. He had been living at 12 West 72nd Street in what was then a hotel, located less than a block from Central Park. The certificate indicates that he was working up until a month before he died as a manager in the furniture business, the same industry he had been working in for 35 years, starting in Detroit, then in Columbus, and ultimately in New York City. The certificate also corroborated the fact that Estelle had predeceased him, as he was a widower at the time of his death. Sol’s remains were cremated by Ferncliff Crematory, and both of his sons, Ralph and Robert, signed a sworn statement to the New York City Department of Health that it had been their father’s wish to be cremated. I called Ferncliff to see if they had any records for Estelle, but they did not; they only had records for Sol. Although I cannot be certain, my hunch is that Sol moved to New York after Estelle died since there is no record of her death in New York City nor were her remains handled by the same institution. I still do not know when or where Estelle died, but I will focus on Ohio as that is where I know she was living as of 1935. 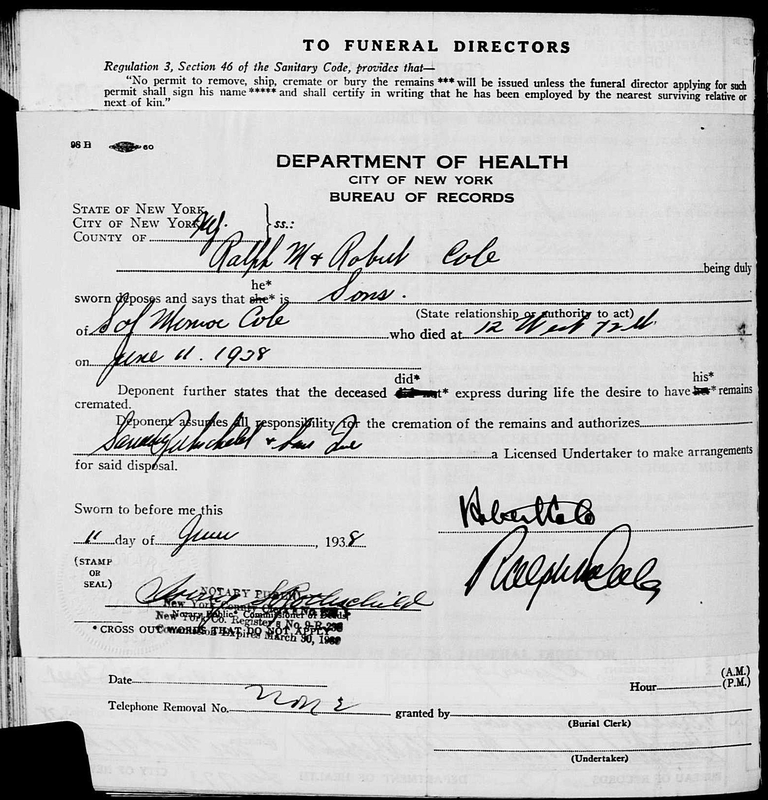 This entry was posted in Cohen, Genealogy and tagged Central Park, Cohen, Cole, cremation, Death certificate, Detroit, Ferncliff, Ferncliff Crematory, genealogy, New York City, Sol Cole by Amy. Bookmark the permalink. Incredible document, there are lots more information in your records of death then we have in ours here in England and good luck with find out where Estelle died. Thank you—it will be a challenge, but I enjoy those challenges! Death certificates can be a fountain of information. Many states are making them very easy to get and when we can we all should take advantage of them. As always best of luck on your research. Thanks, and same to you! I wish NJ would make their records more accessible. They are one of the toughest. I just saw your comment on Stephen’s blog about US copyright. Feel free to contact me if you have any questions. I taught copyright law for almost 30 years before retiring last May. I’d be happy to answer any questions as best I can.